For 2019, all of the vehicles manufactured by Ford are equipped with Co-Pilot360 technology. 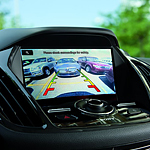 The series of devices assist vehicle drivers and enhance the experience of owning a Ford. Visit our Mossy Ford showroom. Choose your favorite car, SUV or truck and learn more about the amenities. Go for a drive. A strategically positioned rear view camera makes backing up safer. Drivers immediately see what obstacles may be behind them and apply the brakes before a collision occurs. It is not unusual for vehicles to creep up into your blind spot when driving on the highway. The situation becomes dangerous should unsuspecting drivers decide to change lanes. However, with blind spot detection technology aboard, disasters are averted. From time to time, drivers become distracted, which could lead to accidentally drifting into another lane. But, the lane monitoring system quickly alerts the driver who may then make the correction.